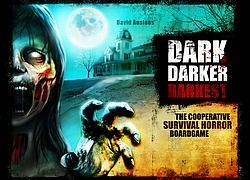 Dark Darker Darkest is an intense cooperative survival horror game in which a team of urban survivors try to fight the darkness in an unsettling location: the house of Doctor Mortimer, which holds the antidote to a virus turning the world into an army of undead. Players must gather the optimal tools to open doors, control destructive fires that slowly destroy the locations of the game, and battle the endless hordes of terrifying creatures that will do anything to slaughter this fragile group, while outsneaking lurking creatures and the eye of the ever-present security cameras guarding the secrets of the house. The game uses innovative mechanisms for group-forming and mixes item management (using a color-code system), exploration, stealth, and icon-driven combat to form an intense tactical experience in a strongly thematic setting riddled with surprises and variation. All the creatures and other challenges are controlled by the A.I. of the game system. The board is modular, creating a unique narrative experience for each session. Can you fight the darkness?